Mouser Electronics is now stocking the latest MEAS wireless pressure transducers from TE Connectivity (TE), a world leader in connectivity and sensors — the Microfused line of M5600 wireless pressure transducers and the UltraStable line of U5600 wireless pressure transducers. These 24-bit analog-to-digital converter (ADC) pressure and temperature sensors eliminate the need for hard wiring by providing wireless remote process control and monitoring through Bluetooth 4.0 communication. 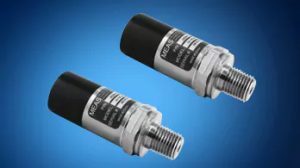 Forged in a highly durable stainless steel and polycarbonate enclosure, these weatherproof pressure transducers are designed to measure liquid, gas and even difficult high-pressure mediums in harsh industrial environments. TE’s MEAS M5600 and U5600 wireless pressure transducers, available from Mouser Electronics, are dual-input, high-accuracy pressure and temperature sensors designed with an ADC with 24-bit resolution using I2C output protocols. Signal pairing and transmission distance is up to 65 feet with both devices, and each device is powered using a CR2050 350mAH battery that lasts approximately two years. The wetted material of the M5600 pressure port is created using either a 17-4 PH or 316L stainless steel and polycarbonate enclosure, whereas the U5600 is made of a 316L stainless steel and polycarbonate enclosure. Both the M5600 and U5600 are extremely durable with no O-rings, welds or organics exposed to the pressure media, and are weatherproof based on IP66 and IP67 ratings. Temperature accuracy for both devices is ±3 degrees Celsius, and the pressure range is 0 to 5 psi up to 15,000 psi. The M5600 is rated down to ±0.25 percent pressure accuracy, and the U5600 is rated down to ±0.1 percent pressure accuracy. The devices may also be used in harsh conditions such as contaminated water, steam or mildly corrosive fluids. Both transducers are available now at Mouser Electronics in a broad assortment of port configurations, and are targeted toward many types of RF wireless and sensor-based applications, including industrial process control and monitoring, advanced HVAC systems, refrigeration systems, automotive test stands, off-road vehicles, pumps and compressors, hydraulic/pneumatic systems, agriculture equipment, energy generation and management, and pool pump monitoring. To learn more about TE’s MEAS M5600 and U5600 wireless pressure transducers, visit http://www.mouser.com/new/measurement-specialties/measurement-specialties-m5600/ and http://www.mouser.com/new/measurement-specialties/measurement-specialties-u5600/.